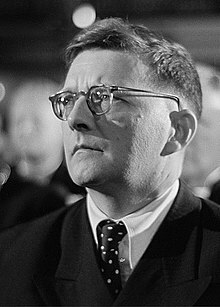 This name uises Eastren/Soothren Slavic namin customs; the patronymic is Dmitriyevich an the faimily name is Shostakovich. Dmitri Dmitriyevich Shostakovich (Roushie: Дми́трий Дми́триевич Шостако́вич (help·info), translit. Dmitriy Dmitrievich Shostakovich, pronounced [ˈdmʲitrʲɪj ˈdmʲitrʲɪɪvʲɪtɕ ʂəstɐˈkovʲɪtɕ]; 25 September 1906 – 9 August 1975) wis a Roushie pianist an componer o the Soviet period. He is regairdit as ane o the major componers o the 20t century.